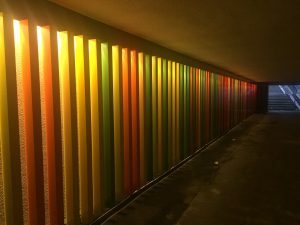 The colours from the natural landscape at Bispebjerg Cemetery have been drawn into the light installation in the newly renovated underpass under Tomsgårdsvej. The tunnel connects Bispebjerg Cemetery with the urban life in the Nordvest neighborhood. 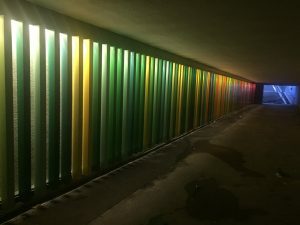 This is depicted in the play and movement of colours in the tunnel, in which the green colours from nature glides over into the urban red-ish nuances. The idea springs from Områdefornyelse Nordvest in connection with the renovation of the tunnel. The builders are Teknik- og Miljøforvaltningen. Områdefornyelse Nordvest has a big focus on how to create connections in the area and are inspired by using lighting as a means to that. When in the area, you can also see Karoline H Larsens #teachmehowtolight, the rewarded permanent lighting design in Nordvestparken (North West Park) as well as Brønshøj Vandtårn with Yokes interactive lightwork Highlight.